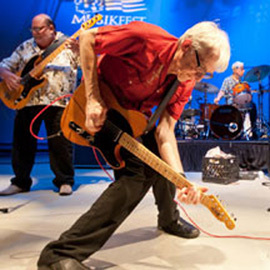 "Bill Kirchen rules, it's just that simple." Bill Kirchen's Honky-Tonk Holiday Show features seasonal songs from Rock 'n' Roll, Blues, Rhythm and Blues, and Country; forgotten classics from the golden age of music such as Red Simpson's "Truckin' Trees For Christmas" and Hank Snow's "Reindeer Boogie", Albert King's "Santa Claus Wants Some Lovin'", some Commander Cody stuff like "Dadd'y's Drinkin' Up Our Christmas", Christmas tunes from Chuck Berry, Merle Haggard, Elvis and much more, celebrating an American musical tradition where country music draws upon its origins in blues and bluegrass, and the Western swing of Texas and California honky tonks. AND songs from Bill's original albums, which have been called "lightning in a bottle." Bill first gained renown as lead guitarist and vocalist for Commander Cody & his Lost Planet Airmen, where the resonant twang of his battered Telecaster drove "Hot Rod Lincoln" into the Top Ten in '72. He's played guitar on recordings and performances with Nick Lowe, Doug Sahm, Elvis Costello, Emmylou Harris, Ralph Stanley, Gene Vincent, Link Wray, Danny Gatton and Hoyt Axton. A Kirchen performance recalls a half century of guitar legends and extends their brilliance into the new millenium. He received a Grammy nomination in 2001. In 2002 he was inducted into the Washington Area Music Association Hall of Fame along with Dave Grohl (Foo Fighters, Nirvana) and John Phillip Sousa as well as winning 10 additional Wammies including Artist of the Year and Musician of the Year. In previous years, he won 2000 Rock/ Roots Rock Instrumentalist of the Year, Roots Rock Album (Raise A Ruckus) and 1999 Instrumentalist of the Year at the WAMA Awards, as well as being a multiple winner in 1997 and 1998, receiving ten awards, including Songwriter of the Year. If you buy someone you like tickets for this show for Christmas, they'll be thanking you for years to come.